This is what I call giving New Media a whole new swing: Day one, workshops during which students soak up skills from some of the greatest masters of jazz. The next evening, those high school and college jazz bands strut their stuff — capped by a swinging finale performed by the master musicians. Over the years those greats have ranged from Dr. Billy Taylor to Randy Brecker, from Patrice Rushen to the late Dr. Grover Washington, Jr.
I’ll be working on a feature piece for the Palm Beach ArtsPaper regarding the one South Florida musical event I try not to miss. 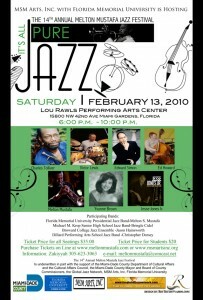 For now, I highly recommend going to meltonmustafa.com for details on the singular pure jazz evening coming up again Feb. 13, at Florida Memorial College’s cozy Lou Rawls Auditorium in Miami Gardens. It’s produced by the internationally known trumpeter, arranger, composer, Florida Memorial director of jazz studies, gifted music educator, bandleader extraordinaire, and one of the most humble human beings you’ll ever meet, Melton Mustafa.